back to the Cloudview Parking lot. 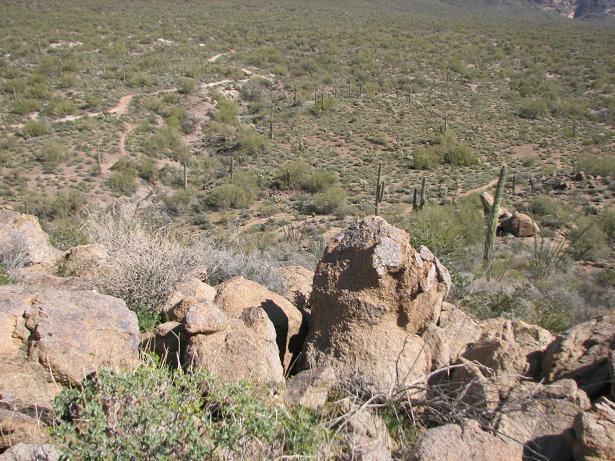 Review: Trail starts just south of the Superstition Mountains in a saguaro forest. Classic Sonoran desert with edible wolfberries and hackberries. Storms stack up against the mountain making for a wetter area. Great spring wildflower area. K-Trail down hill is one of the most fun trials in the state, many u shaped arroyo crossings and drops. Review: great secluded trails, GPS coverage is a little murky. Review: Riding down hill on K-Trail and Cougar is more fun than uphill. Lost Goldmine is rough and multi use. Cougar isn't yet marked from the north end of the trail. Awesome system. Secret, Tech & K MTB Trail 5.00 out of 5 based on 4 ratings. 4 user reviews.